I mentioned the other day, about my experiences with an alternative physical therapy called Reiki. And it was not for me, but for my Golden Retriever Pollo. Here is the back story on how I became a believer in something that otherwise would never have made sense. First, let me say that I have been a pet owner, most of my life. I was a professional animal caretaker for over fifteen years. So I am very well aware of the traditional means of taking care of our furry loved ones. Now for Pollo. 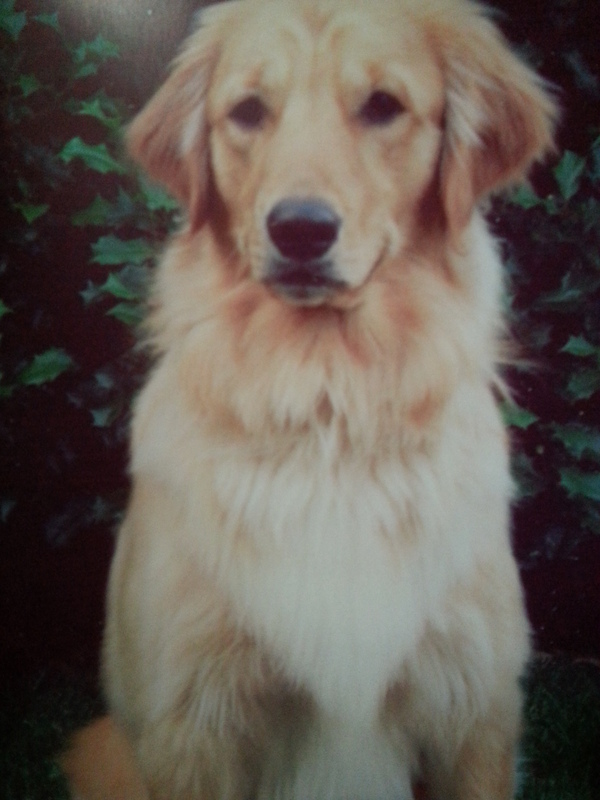 Pollo was an interesting Golden, because his personality, while always happy, he often did not have the characteristics of an average Golden Retriever. He had no ability to retrieve anything, or perhaps had no desire to. Watching him chase after things often reminded me of the chase scenes between Wile E. Coyote and the Roadrunner. I often felt that Pollo could not catch his own shadow. His sense of smell was also very bizarre. He often did not smell for his food, other dog’s scents. I would hide treats for him, and again, either he really was not interested in “working” for his snacks, or his sense of smell really was that bad. But it was a strange habit that Pollo had that often left me frustrated, and it was because of his selective sense of smell. Pollo loved backyard mushrooms. Now in Pennsylvania, this is not a good thing. It is nearly impossible for even humans to distinguish between good mushrooms, and the poisonous types, let alone, for a dog to figure out. When Pollo was six, 42 in human years, Pollo discovered mushrooms. I had been out for the evening, and it was going to be late. So in the middle of my evening, I came home to let Pollo outside to take care of his business. What I came home to was a huge mess. Pollo had vomited severely. But as I only had intended on just letting him outside to go to the bathroom, I had to do a quick clean-up also now to return to my friend’s home. But if Pollo was not feeling well, I needed to confine him so that there was not a mess all over the house. I was lucky this time, the clean-up was confined to the solid kitchen floor. I had confined him to his cage. Looking back, definitely was not a great idea. Sure it would minimize any additional clean-up, but instead, the poor guy ended up covered in his own mess. Which for a long haired dog, meant a bath at 3:30am, including blow drying his fur. While cleaning up his cage, I discovered the cause of what had been ailing him, a mushroom stem. I notified the vet immediately about this at 5am, and he informed me that there would probably be no concern, just had to let the mushroom toxicity run its course at this point. He had been vomiting quite a bit, so the vet was right, it would just have to run its course. But anyone would common sense would learn from their mistake, and I really do believe Goldens are quite smart, and in spite of me keeping my lawn at “putting green” height to make sure that I could prevent Pollo from eating any more mushrooms, one of only two times he would actually use his sense of smell (the other for sensing when snow would fall), he would still be able to smell the mushrooms under the ground that I could not see. And so, every year, we would have an incident at least once, when we did not watch Pollo closely enough, he would get ahold of a mushroom. And we could tell it would be coming because he would get the glossy and watery eyes, and the drool would start pouring, and he was officially getting stoned. And then of course the same result as every time before… more clean-up. But three years ago, this habit of Pollo’s almost cost him his life. Besides the fact that we cannot differentiate the toxic mushrooms from good mushrooms, our babysitter had not been able to follow Pollo as closely while she tended to our daughters. Unbeknownst to me at the time, Pollo had overdosed on mushrooms, having eaten at least 9 of them. All the sitter could tell me was that Pollo would not stop vomiting, and it was a lot. I made the decision to take Pollo to the vet, where they finally got him to settle down as far as vomiting, but they could not figure out what was the cause. I came back the next day to pick Pollo up from the vet, but something had happened. When they brought Pollo out to me, he was lame, clearly not how I brought him in and I excitedly told them that something was definitely wrong, not how I brought him in. They took Pollo in for more studies, which came back inconclusive, and said there was nothing else to be done. Once at home, I would have to use my professional animal care skills to help Pollo. He could no longer stand up, stand on his feet, or walk. Using a towel as a sling, I helped him to maneuver around. And this went on for weeks, with no improvement. My mind obviously went to other places, about the possibilities of my fur friend suffering at this point. And that is when I reached out to my friend Jenny Hughes. I generally always lean to traditional medicine for things as they are the only things scientifically proven, and admittedly, I can be a cynic at times. But Jenny had been doing a new kind of pet therapy, Reiki, and when I asked her if she thought she could help Pollo, she was more than willing to do what she could. It also helps that Jenny is a known animal lover, so I believed in her ability to help Pollo. Upon Jenny’s arrival into my home, Pollo, who normally would have been barreling through the house to greet anyone entering, just laid on the floor, unable to get up. Jenny laid down beside him, and started the Reiki therapy. Within moments, Pollo was fast asleep. And when she happened to move her hands from the area of his body that were causing him the most trouble, he looked up as if to say “hey, get back to that NOW!” And she did so, and back out he went. See the video clip below. By the time she was done, I had already paid her for a second session piggybacking onto the session right away. I was pulling out all the stops to save my friend. It now became “wait and see” what happened. I knew at least one thing when she finished, he was relaxed, no longer dealing with the stress and frustration, and most likely pain. But the next day, he had begun to try to sit up on his hind quarters, something I had not seen in weeks. But because he had not been using his hind legs much in weeks, his back would not support him. What I had to do was position him into a corner, so that when he would try to sit up, he would have pressure from the corner behind him, holding his hind end in place. Later that day, after many assisted attempts, he stood up on his own. The next day he was actually walking, gingerly of course because he was still weak. But he was walking on his own. I followed him with the towel under him as a sling, just in case, but he was bearing his full weight on his own. The next day, he was on his own. They say that it is difficult to believe in things we cannot see or understand. But I know this, Jenny saved Pollo where conventional vet medicine was not able to. Pollo would have a relapse a year later with the lameness, and again, I would call Jenny. And again, it worked. I saw it with my own eyes. And for that, I am forever grateful to Jenny for giving me an additional three years with Pollo that I most likely would never have had.